Hey. It’s Friday. Time to eat a donut! It’s also time to be lazy and fun and do way too much online shopping and stare at the clock until quitting time, so therefore I will be spelling it d-o-n-u-t. Short and quick. Oh and guess what? I’m such a hypocrite. I generally do not like cream filled things. Think donuts, cookies, ladyfingers, twinkies, pound cakes, etc. And here I am, telling you about a cream filled thing. Wait. Is it cream or creme? Oh well, I don’t really care. Because it doesn’t matter when it’s peanut butter cream. Freaking peanut butter cream. What? Hello heaven. At the beginning of October I was telling my brother about my current doughnut obsession and he asked if I had ever tried a peanut butter cream filled doughnut. Um, what? Pretty sure if I ate a peanut butter cream filled doughnut that my face would explode in excitement and then I would die. Well. That didn’t happen. But it was still pretty close. 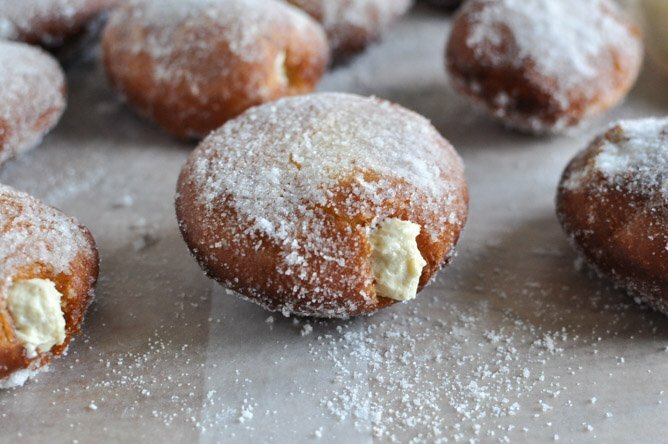 I’m going to be frank: these doughnuts are a bit high maintenance and if you plan on making them for breakfast or for company, your best bet is to plan ahead and prep them the night before then wake up super early to finish them. That’s why it took me so long to fiiiiinally try them. Or okay, if I’m being honest, the reason it took so long is because I spent 24 hours on a first crack only to have them massively fail. Huh… THAT was a fun day. So since it’s Friday, don’t you want to absolutely definitely make these? And don’t you really want to look back in a month and say that 2012 was the year that you made a peanut butter cream filled donut? The answer would be yes. While the dough is refrigerating, make the pastry cream since it has to chill. In a small bowl, stir together flour, sugar and salt. In a large bowl, whisk together egg yolks. Slowly add the flour mixture to the eggs, whisking until smooth and pasty. Heat a saucepan over medium heat and add milk, allowing it to heat until bubbles form around the edges, but not boil. Remove the milk and slowly add it to the egg/flour mixture, whisking constantly until combined. Once smooth and mixed, add the entire mixture back to the saucepan, heating over medium heat and stirring constantly. Cook until it thickens and comes to a boil, about 2-3 minutes. Immediately remove from heat and strain through a fine mesh sieve, the whisk in vanilla and peanut butter. Place in a bowl and cover with plastic wrap, pressing it until it touches the surface of the cream. Chill for at least 4 hours. Remove dough and place on a floured surface. Roll it out until it is about 1/2 inch thick, then use a standard size biscuit cutter and cut out as many rounds as you can. Place on a baking sheet in a warm place and let rise for 2-3 hours, until they’ve doubled in size. Heat a few inches of oil over medium-high heat in a large saucepan. Once the oil reaches 350 degrees F, add the doughnuts 2-3 at a time and fry until golden brown, about 2-3 minutes per side. Make sure you are using a thermometer – do not allow your oil to get too hot! The doughnuts need nearly 4-5 full minutes in the oil so the insides cook, and if it’s too hot the dough will burn. 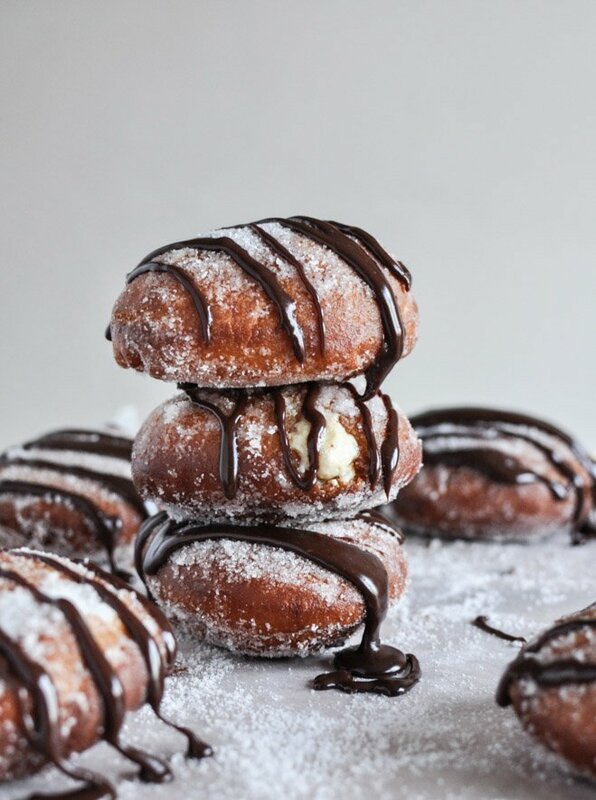 After frying, transfer each doughnut to a paper towel to let the excess oil drain. Let them cool to the touch, the roll in the remaining sugar. Give the doughnuts another 30-45 minutes to cool completely. While this is happening, beat the cold heavy cream in your electric stand mixer or with a handheld mixer until stiff peaks form. Fold in the peanut butter pastry cream, taking a few good minutes to fold it in completely with a large spatula. Using a pastry bag or simply a ziplock bag (or even a spoon), poke a hole inside the side of the doughnut and fill it with a bit of the pastry cream. To make the chocolate drizzle, heat the heavy cream until warm then pour over the chopped chocolate. Stir continuously until melted and smooth, then cover or drizzle the doughnuts. These are best when eaten immediately! I mean… peanut butter cream. I can’t eat fried foods I have to ask it. These look delicious, I think I know what I will make for next weekend’s breakfast. Thanks for sharing! 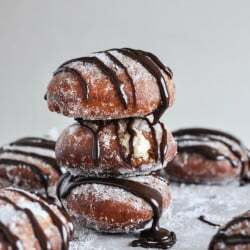 I shared your amazing recipe in my National Donut Day Roundup! Thank you so much!! How much pb cream does this yield? Also what are the size of the doughnuts? 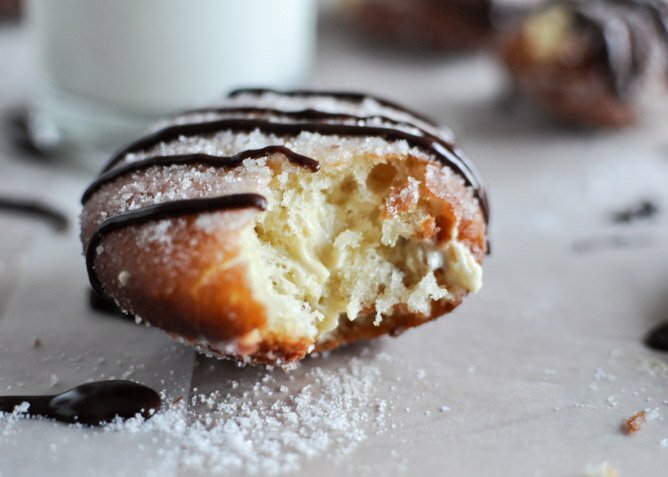 Pingback: Go Nuts for these Homemade Doughnuts this Donut Day! Do you have any tips for keeping the oil around 350 degrees? I made homemade donuts this weekend but the oil would get too hot and then too cold the entire time. I was using a thermometer and it was making me crazy watching the temperature go up and down….and the few donuts that were extra crispy. Thank you so much! Love all your recipes! Would like to now if u can cut it down but still taste the same..can thay be frozen and keep the same taste..